Sudden and inexplicable changes from feeling happy to depressed and then angry can be extremely hard to deal with on a consistent basis. Therefore, if women believe they are suffering from irrational moodiness during menopause, they should consider some of following tips for treating extreme mood swings. Usually, extreme cases of mood swings are distinctive of bipolar disorder, also known as manic-depressive disorder. Bipolar disorder is characterized by alternating episodes of elevated mood - or mania - and low moods, or depression. Because this disorder requires medical treatment since it is a psychological condition, normal lifestyle changes of just optimizing diets, practicing wholesome habits, and partaking in regular exercise will not cure the underlying cause. More advanced measures, such as therapy and medications, should be pursued to directly combat the hormonal imbalance at fault, effectively treating extreme mood swings. Psychotherapy is often instilled as a valuable part of bipolar disorder treatment. The most commonly referenced is cognitive behavioral therapy, during which triggers will be identified and unhealthy behaviors will be replaced with healthy ones. Electroconvulsive therapy (ECT) may also be utilized in some cases. During ECT, electrical currents are passed through the brain to trigger a brief seizure. By doing so, brain chemistry is altered, and certain symptoms of mental illnesses are reversed. Also, some people may wish to pursue acupuncture to help treat extreme mood swings. Acupuncture stimulates the central nervous system to regulate stress responses and clear any energy blockages, allowing the body to heal itself. These are often the standard go-to for bipolar disorder medications. Most common stabilizers used are lithium, valproic acid, and divalproex sodium, among others. These are used to treat depressive states, but they are usually prescribed alongside mood stabilizers or antipsychotics since they can trigger manic episodes. These can be prescribed alone or alongside a mood stabilizer. Examples include aripiprazole, quetiapine, olanzapine, and asenapine, among others. As the name suggests, these medications combine those for depression and manic episodes to effectively treat both spectrums of bipolar disorder. Depending on hormone levels, doctors may see it necessary to prescribe hormone replacement therapy (HRT) alongside other bipolar disorder treatments. Use HRT with caution. Although it will help treat an array of symptoms, including mood swings, its use can lead to an increased risk of breast, ovarian, and endometrial cancers; stroke; or blood clots. Before pursuing any line of treatment, it is important to receive a proper diagnosis from your doctor so that you can know how to best go about treating extreme mood swings. 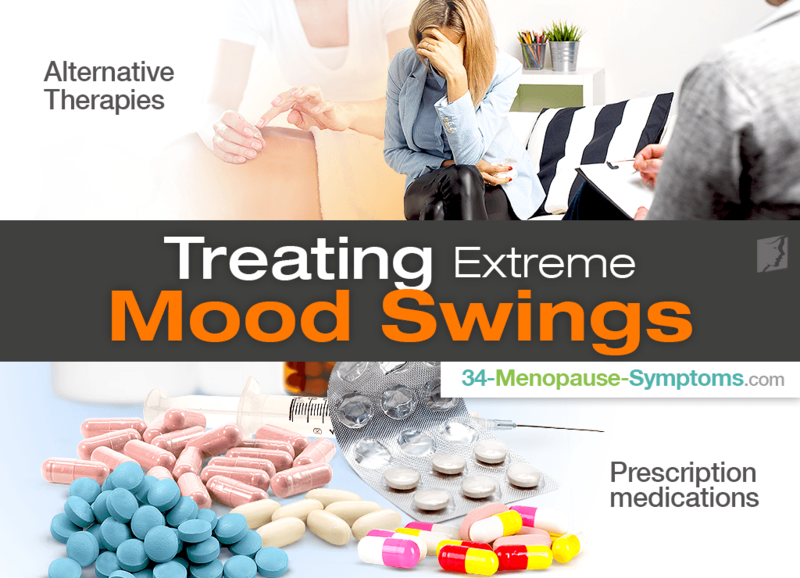 For menopausal women whose extreme mood swings are not bipolar disorder, following natural and less invasive mood swings treatments will bring optimal relief as they focus on resolving the underlying cause of hormonal imbalance. Although mood swings can increase during menopause, it doesn't mean you should feel defeated.